Do you remember the simple joy of creating one of these? Consider sharing this wonderful experience with your students this autumn. It couldn’t be easier and the rewards are great! For supplies, you will need only three things. Paper… nothing fancy… copy paper works great here. Crayons… broken into easy-to-hold chunks with the paper peeled off. An assortment of leaves and maybe even some small twigs and branches. Your students will love exploring outside to find just the right leaves and twigs. If you have magnifying glasses — even the super inexpensive ones — give them to your students to use. (You won’t believe how focused they get!) 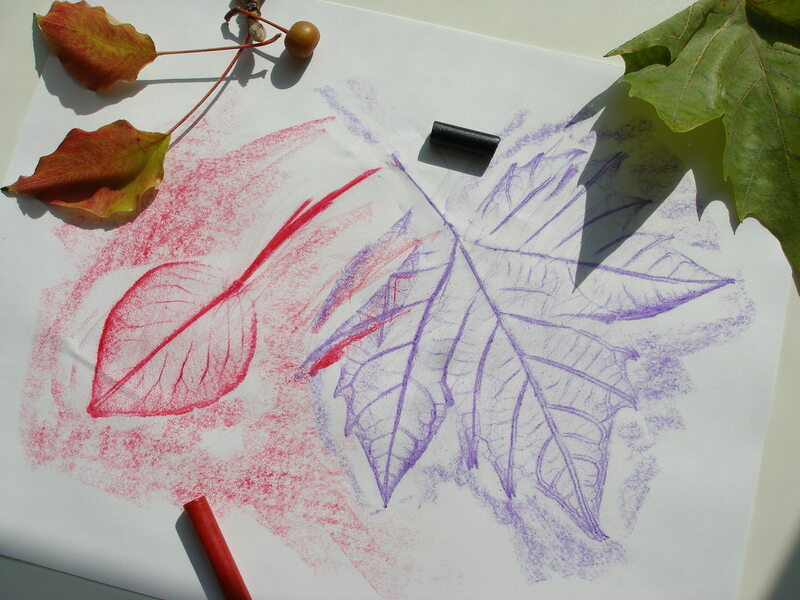 Once back inside, explain the process of placing their leaves and twigs underneath their papers so they can rub over them using the sides of their crayons. A simple pantomime of how they will rub over their paper using the crayon is enough — you don’t have do actually do it — let them have the thrill of discovery themselves. And they will be thrilled! When the rubbed images appear, it’s like magic and they love it! And don’t be fooled into thinking your kids are “too old” for this experience. As a high school art teacher for many years, I was consistently shocked by how many of my juniors and seniors had never done this. And the ones that had, had such fond memories of it, that they loved the opportunity to do it again. For other simple ideas about how you can easily incorporate art into your classroom and support the curriculum you are teaching everyday, please check out the affordable, convenient, self-paced Professional Development courses I teach through Fresno Pacific University.